Saturn transit from Scorpio to Sagittarius on 26th January 2017. Saturn leaves your 4th house and will be in 5th house till next transit (till 24th January 2020). From the 5th house, Saturn aspects your 7th, 11th, and 2nd house. 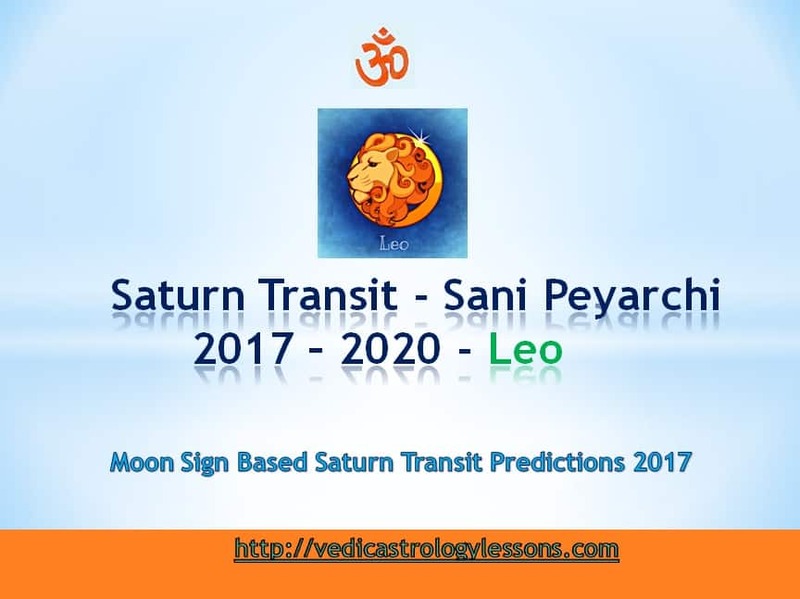 Saturn Transit 2017 effects on Leo: The presence of Saturn in your 5th House( Sagittarius sign) will result in the occurrence of auspicious activities. The 5th House is the sign of intelligence and thinking. The presence of Saturn in this position will see you acting according to your thinking. This can happen both ways. Sometimes you will act very intelligently and other times you might experience forgetfulness and loss of concentration. Your health issues will get resolved favorably. All your illnesses, tiredness, loss of money matters will now stop bothering you. You will be full of energy and vitality. Money flow will be good. Your speech prowess will also increase. Your family will see new members entering your fold. You will be clever in handling new subjects; You will learn new stuff with interest. Your detailed planning and hard work will garner good results. Your mother’s health will be quite good. Chances of buying new properties, houses, vehicles are present in your life now. Unexpected bonanza in the form of ancestral property from your father’s side or mother’s side can be seen. But do not just believe in luck and put your whole heart into your work. You will get the support of influential members of the society. But you can expect some trouble from that quarter too. Your hard work will provide benefit to others. You might lose objects in front of your own eyes. Your interest in celebrations might come down. Instead, you will be more inclined towards spiritual voyages and worship. After the Saturn Transit, Your romantic life will be pleasant and work to your wishes. Some of your love stories might end in a happy union. New career opportunities will arise for the jobless. Though court cases might seem to run in your favor, you can see obstacles rising then and there. Your enemies might get stronger. You might have to struggle hard to fare well in competitive exams. Your workload will be very high compared to your pay. Do not try to recoup losses in share market with unwise investments. Be very cautious in spending money on races, lottery, and clubs. Those in high job positions should be wise enough to steer clear of such temptations. Be careful in dealing with your employees. Follow a wholesome and well-planned diet for your health. Though your employees might try to help you, you might have to face some embarrassment due to them. Your friends will prove helpful to you. Childless couples will have to undergo trials and tribulations to beget children. So it will be better if you do not try to put off child-bearing now. You should be very sincere and put your full efforts in your work. Only then you can see some success in this competitive world. Based on your current Dasa and Bhukti(Subperiod) the effect of this Saturn transit for Simha sign will change.